Tom Cunliffe is one of Britain’s leading speakers on maritime matters. He is a fellow of the Royal Institute of Navigation who uses his high level of expertise and hands-on ocean experience to entertain and inform a wider audience. He read law at the University of Liverpool but soon abandoned the Inner Temple to make the sea his life’s career, working on vessels of all shapes and sizes. He has served before the mast in small sailing ships, skippered yachts for private owners, raced offshore, been to sea as mate on a British-registered coasting vessel and taught sailing, seamanship and navigation at all levels. He is a senior Yachtmaster Examiner and a consultant for the governing body of sailing in the United States, where he has also lived and worked. Specialising in vintage sailing craft, he has become a world authority on traditional rigs, addressing international seminars in Britain, Europe and the USA. 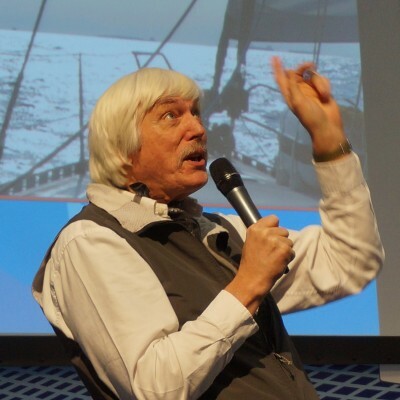 He is a columnist for Classic Boat, Sailing Today and Yachting World and writes for magazines in America, Australia, France and Germany, as well as being the author of over twenty books. His texts on seamanship and navigation are standard works and two of his books have won literary awards, including Topsail and Battleaxe (Best Book of the Sea 1989). Good Vibrations, a travel book about riding the plains of America on a motorcycle in the company of prospectors, strippers, gamblers, preacher-men and his wife (on her own motorcycle), was the best-selling book at a recent London Boat Show. Tom Cunliffe’s face is familiar to many as a TV presenter. In recent years he has fronted the popular Discovery and Quest series Boat Yard and his award-winning BBC series, Boats that Built Britain. As a speaker, his career has come full circle, with the talents he opted not to deploy as a barrister now barnstorming to the fore. His historical lectures are authoritative as well as entertaining, but he can be downright hilarious on subjects such as how to survive storms in the bank balance as well as those at sea, based on the outrageous experiences of his early years as a penniless ocean gypsy. If a motivational message is required, it is so far from mainstream of life that it slips across almost without anyone noticing.